I had the pleasure of watching former Governer of Minnesota, Jesse Ventura, take on a little known yet highly controversial topic on Tru TV last night - HAARP. High Frequency Active Auroral Research Program is a military complex way the heck out in (nowheresville) Gakona, Alaska that has 180 antennas and emits crazy amounts of kilowatts into the ionosphere. It can be directed like a beam to super heat sections of the atmosphere as far as 40 to 60 miles about the surface of the Earth. I originally wrote a blog post about this HAARP thing back in Oct 2008, and I realize my own need to learn more about it. The program is run by the military. They claim it's a harmless weather experimentation device that will better help us understand our ionosphere along with helping satellite communications and finding things like hostile submarines and such. Critics of the program point out that the military is not known for running harmless programs and that they're not being forthright with the full potentials and problems that HAARP may cause. The concept for the ionosphere heater was originally thought of by Nikola Tesla, a Serbian-American inventor and electrical engineer who lived from 1856 to 1943. 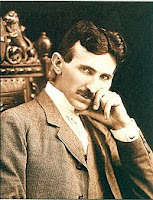 An extraordinary genius far beyond his time, Tesla was regarded by some as a mad scientist. This is probably due to the fact that his discoveries involved transmission of energy, power, electricity and more. His ideas were revolutionary, creating the AC power system we used today and so many other things that were cutting edge technology, even by today standards (like wireless transmission of electricity). His ideas could be used for good or evil, but Tesla despised war and wanted to create weapons that would actually eliminate war because they could destroy essentially everything. And this was all well before the atomic bomb. One of his inventions, the teleforce or death ray weapon, attests to his concept of weapons that could end war. Exactly when, how and why the scientists put together the work of Tesla and HAARP remains a mystery that the military is not openly discussing. At least people like Jesse Ventura are finally asking hard questions - like what can this thing really do and shouldn't we all know about it? What do you think about HAARP? I personally don't know much about it, and I admit that, but I also sense there is something concerning that makes me want to know its exact purpose and potentials. There's a book called, Angels Don't Play This HAARP; Advances in Tesla Technology by Jeanne Manning for those who'd like to learn more.